Planned giving donors will become members of The Anchor Society, honoring alumni, grandparents, parents of alumni, current parents, faculty and staff who remember Bullis in an estate or financial plan. The Anchor Society plays a significant role in Bullis’ future, and the stability of our mission. The name is also a respectful nod to the history of Bullis as a prep school for the Naval Academy. Members of The Anchor Society, like all donors to the school, are recognized in the school’s annual report each year. We hope that you will consider joining The Anchor Society by including a gift to Bullis as part of your estate planning. Bequest: This is the simplest kind of planned gift—a provision in your will which names Bullis as a beneficiary and provides your estate with a charitable tax deduction for the total amount of the gift. Charitable Gift Annuity: This is a contract between you and Bullis. Assets (cash, stocks or real property) are transferred to the school and in return you receive an annuity payment for the remainder of your life. Charitable Remainder Trust: You transfer assets to a legally established trust which then pays you an annual income for life. At the transfer of your estate, the trust’s assets become a gift to the school. 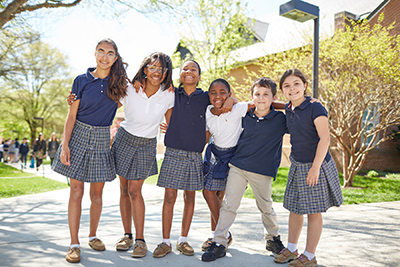 Charitable Lead Trust: You establish a trust that transfers assets to the school; the trust generates income for Bullis for a specified number of years. At the end of that time, the funds are returned to you or to your heirs. For more information, please contact Sharon Kessler, Director of Annual Giving, at 301-634-3697. Bullis provided our daughters with a world-class, exceptional and well-rounded education and a warm and supportive environment. A planned gift is a way to look back and express appreciation to Bullis, and ensure that Bullis can continue to play an important role for children and families. We hope in some small measure our gift can have long-term impact so Bullis may continue a rich tradition of caring for and challenging students. Education is so important to this country and that’s why we are happy to give back after all the School has done for our family. It’s part of perpetuating the excellence of Bullis.